On September 8th 1966 the first episode of Star Trek aired. This Sept 8th, we’re celebrating 50 years of Star Trek! 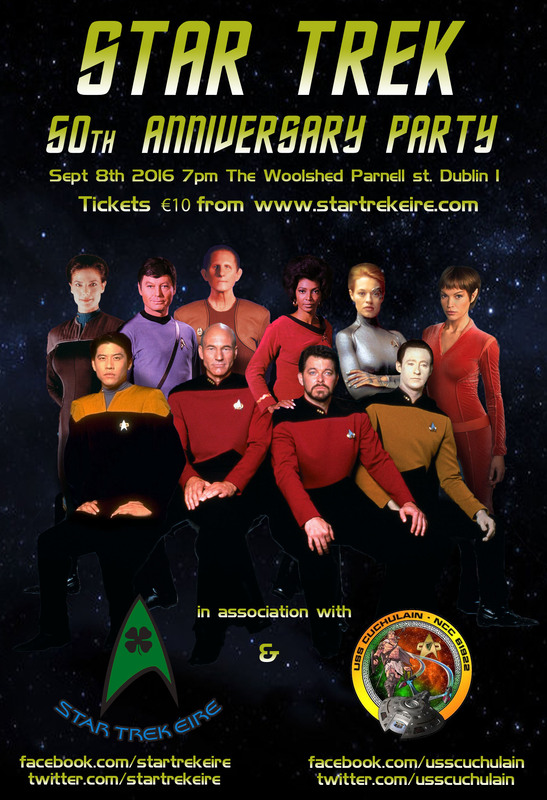 Star Trek Éire and the USS Cuchulain are teaming up to bring as many Irish Star Trek fans together for this special occasion as possible. We hope you can join us! Our evening will consist of 3 of Star Trek’s most beloved episodes, a Star Trek quiz and raffle plus a ‘Quark’s’ style bar on the night. Tickets Only €10 Online Tickets SOLD OUT! Please fill out the form below to be added to the standby list. You will be contacted in advance if there is a ticket for you. Thank you. Your ticket price includes finger food on the night and there is a gift of a Star Trek book to the first 40 tickets sold online! Please get your tickets as early as possible so we can make this the best possible night! The event is in a safe and fun environment in a pub. Although many seats are available a seat is not guaranteed. Doors open at 7pm, event starts at 8pm. If you ordered an early bird ticket that includes a book, you must collect this book on entry. The books available have been donated by Sinéad Doyle from her collection.